EDISON, N.J. (FEBRUARY 2, 2016) — SFA Saniflo U.S.A. has unveiled two new, vitreous china, floor-mounted toilet bowls with an updated and contemporary styling, the better to complement modern bathroom design. Available in white with either an elongated or round front, the new bowls are being combined with four current Saniflo macerating plumbing systems: Saniplus, Saniaccess2, Saniaccess3 and Sanibest Pro. Clean and highly efficient: Saniflo vitreous china toilets are designed for durability, with a high-gloss finish that is easy to keep clean and fresh. 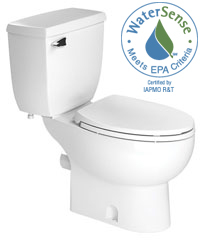 Both toilets are high-efficiency, meeting the WaterSense® labeling criteria of the Environmental Protection Agency (EPA) and using only 1.28 gallons per flush (1.28 GPF). 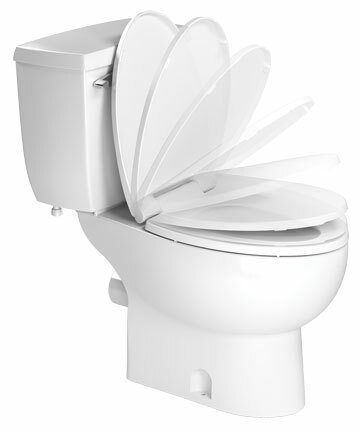 Carrying a one-year warranty, both units feature a wash-down-style flushing action with a 3-inch trapway. The vitreous china toilet tank used with both bowls is insulated at the factory to minimize water droplets created by condensation. 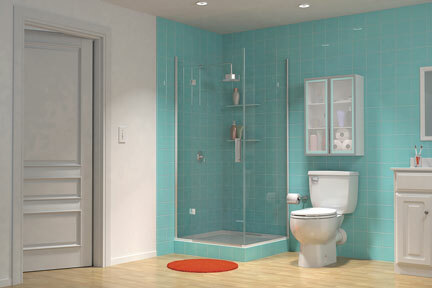 Inside is a flush valve with a silicone flapper seal that also has a one-year warranty. 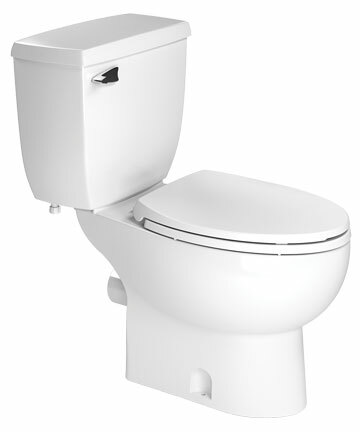 Both the elongated and round-front toilet bowls have a floor-to-rim height of 16.75 inches, enhancing user comfort and convenience. The elongated model, which measures 28.75 inches deep, complies with the requirements of the Americans with Disabilities Act (ADA) because of its shape and height. Both new china units feature stylish, soft-close toilet seats (photo right) that are included with the fully assembled bowl and tank along with all the other necessary hardware to complete the installation. How Maceration Works: The integral P-trap of the bowl evacuates through a spigot outlet in the rear of either new bowl, rather than at the bottom, as with a conventional toilet bowl. This configuration permits connection with the Saniflo macerator, located behind the bowl — either between it and the wall, or concealed behind the wall with the use of Saniflo’s special extension pipe. For the first time, this pipe includes paintable decorative trim for a cleaner finish to the installation where the pipe penetrates the wall. Saniflo macerators quickly and quietly reduce incoming solid and liquid effluent from the toilet bowl before discharging it vertically through small-diameter piping to a sewer or septic line. These above-floor plumbing systems allow home and building owners to create bathrooms wherever they are needed, even where no below-floor drainage exists — thus avoiding the hassle and expense of breaking through floors. The elongated version of the new chinaware from Saniflo is shown above. Both new bowls will be used with the Saniplus, Saniaccess2, Saniaccess3 and Sanibest Pro systems. 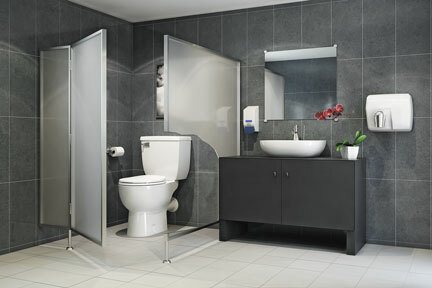 Both of the new vitreous china units from Saniflo feature stylish, soft-close toilet seats. 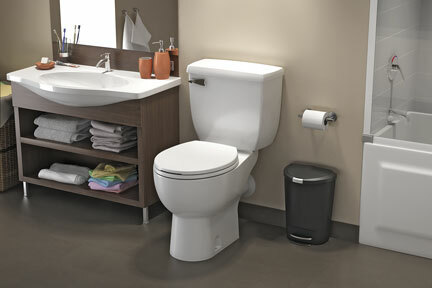 Both vitreous china toilets (elongated model pictured above) from Saniflo are high-efficiency, meeting the WaterSense® labeling criteria of the Environmental Protection Agency. Both vitreous china toilets (round model pictured above) from Saniflo are high-efficiency, meeting the WaterSense® labeling criteria of the Environmental Protection Agency. The round version of the new chinaware from Saniflo is shown above, with the Saniaccess3 behind the wall. Both new bowls will be used with the Saniplus, Saniaccess2, Saniaccess3 and Sanibest Pro systems. The round version of the new chinaware from Saniflo is shown above, with the Sanibest Pro behind the wall. Both new bowls will be used with the Saniplus, Saniaccess2, Saniaccess3 and Sanibest Pro systems.